Still I don't care and we have the opportunity to play our football on the countries national stage. Cambridge will be favourites and rightly so after there comeback against Stevenage who I must say were again hard done by with another awful sending off decision. At least there will be w a few more seats filled for the final - 2000 of us and 8000 of them. Only kidding but you do wonder after the poor showing on Friday. Two Wembley appearances in two years lets all hope we can take this opportunity - it may be our last chance for a while. The standard and skill levels have left a bit to be desired but the competition commitment and application is better than ever and if we do actually regain our league status one part of me would feel more than a little sad. No more regular TV coverage and the last two seasons have been so enjoyable because we have been competing at the sharp end and have always in contention. Finally a mention has to be made about Greavsie's performance today his legs were gone on a very heavy pitch but always stuck his head in when it mattered and won countless near post headers form there dangerous long throws and corners. I couldn't agree more with merse it was shocking display of "gamesmanship" from histon. Watered pitch and shocking facilities that make this league a joke. I just really want out of it. They tried to ruin the game and they sucseeded but in the end we won through . I would like to comment more on the game but I was so nervous that I spent most of the game walking up and down chatto road outside the john bull because I couldn't bear to watch it. Strange day in many respects. Had a laugh in The Railway Vue beforehand. Pub completely taken over apart from a handful of Histon fans. good banter but no hint of trouble. Then on the walk to the ground whilst chatting to a couple of ex Cambridge directors we came across the first set of Cambs fans. Oddly we wished each other well. 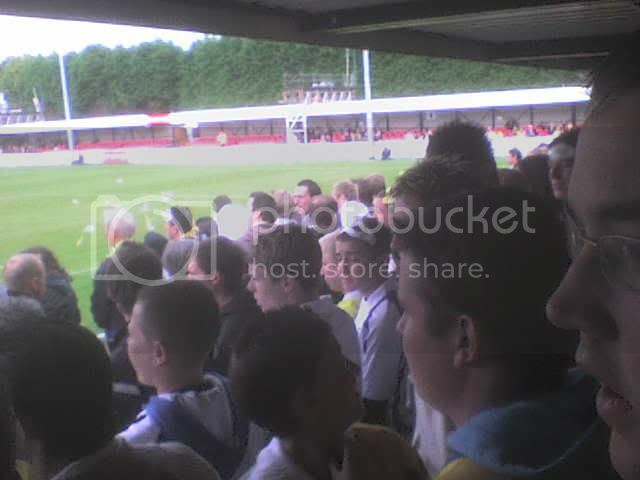 More had gathered overlooking the ground and were supporting the Gulls, most bizarre, never been to a game like it. The ground has changed since we last went and is more covered, shame they hadn`t done the same with the pitch. what with the cabbage patch & Histons tactics we just couldn`t get hold of the ball. Things looked ominous after 20 odd minutes a goal down & losing sturrock, his injury looked long term. We showed signs towards the end of the half that we were getting back in and the second half seemed fairly even apart from the last 10 mins. This was never going to be a football match. It was all about battling to the last. Our defending at times was right on the limit but we held out. The second half seemed to go by a bit quicker than the first, but I still had in the back of my mind the ref was going to do something. He tried with the aid of the lino at the away end but luckily nothing came of the "free kicks" that were awarded. I hope we get some decent officials for Wembley. Poke held everything in the air apart from a couple of crosses which he turned around. And his reaction tip onto the cross bar was top drawer. Todd & Robbo at the back were towers and towards the end Greavsie was a giant in defence with his clearing headers. Have to agree about Benyon & Stevens, fine for footballing sides like Burton but against no nonsence outfits like Histon you need a bit more muscle. Still fortunately the game at Wembley may just suit them a bit more. Have to say I know Rice has had his critics in the past, but you cannot fault him as a clubman. pre match he looked happy and was determined. Then at the end he ran across and hugged Poke. I hope he gets the break in football that he deserves whoever it is with, its a shame more pros don`t have his attitude. Histon is a friendly club & we enjoy going there, its just a shame they play the way they do. so merse wasn/t impressed with stevens and benyons contribution tonight. well to be fair danny didn/t have the best of games,the pitch wouldn,t have helped his style of play. as for elliot benyon, christ only knows what he has to do to please some people. 13 goals in only 19 starts! in my opinion due to the unfortunate injury to sturrock, benyon changed the shape of the game. constantly attempting to get behind the histon defenders and never stopped running, mainly on his own up the front. i have no doubt whatsoever with the right service and played on a regular basis he would be a 20 plus goals man . finally i hope he gets his just reward and holds his place on may 17th. I completely disagree about Benyon - yet again he has been shown to be too lightweight for such a game, flattreing only to deceive when he beat the sluggish centre backs and put tame shots towards the goal. My MOTM would echo earlier suggestions, but Hargreaves would edge out Nicholson; Robertson and Todd in that order. I only taken 4 photos yesterday as I was busy videoing a lot of the fans. I think a little more graciousness could be afforded to Histon by some on here and at the ground yesterday. Let's not forget that we have a 50% chance of having to play there again next season. It was a tense horrible game to watch but a weak referee made it all the worse by being quite lenient on a lot of Histon challenges. I don't mind watching hard competitive football with players challenging for strongly yet fairly for the ball, but when you have players jumping into the player who's going for the ball then it needs a strong ref to get the book out early and draw a line in the sand. I've been replaying the challenge in my mind by Mitchell-King on Hargreaves in the penalty area. Hargreaves managed to flick the ball on despite being bear hugged by that 6 foot 4 gorilla and yet the referee gave a foul against Hargreaves. I suppose the ref was nowhere near as bad as the one we had at Salisbury but surely for a game of heightened importance they should supply us with a decent ref. I'll go along with other posters on here and say that Hargreaves, Todd and Robertson had great games, especially during the second half onslaught. The football Histon play is awful to watch but like some of the lesser teams in the Premier League (Bolton, Stoke) inherently necessary to make the best out of their situation. Anyway, enough rambling. Here are a few photos. Sills appeals for a foul against him. Top work Timothy! 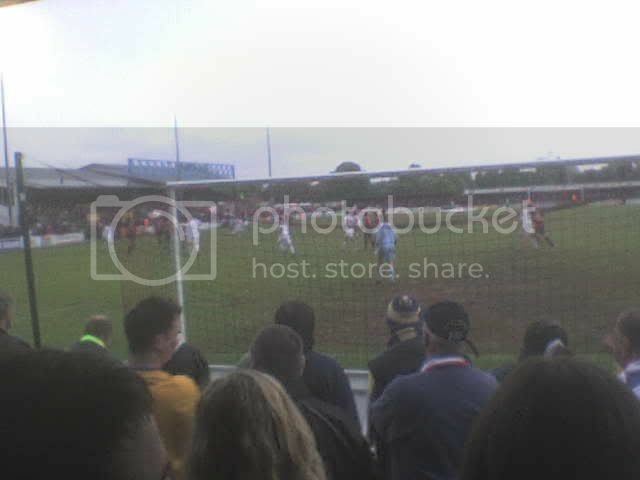 Histon as a team were no mugs. They know their strengths and play to them and with a bit more luck would be playing Cambridge instead of us. The pitch looked like Farmer Tully had been planting teddies and was watered to death. One hopes that the ref will put the condition of the pitch in his match report (I shan't hold my breath). Certainly a blow if Sturrock isn't fit for the final. Looking forward to the 17th - 90 minutes or so away from League footie. I think a little more graciousness could be afforded to Histon by some on here and at the ground yesterday. OK so they have come a long way fast but admission charges should be commensurate with what is on offer and as they've got a two bob ground they should only be charging two bob prices and not hiking them up when they can't even provide adequate toilet or refreshment and as for that view as illustrated by Joe's pic from the away end...............well you can stick that where the sun doesn't shine matey, I wouldn't pay fifty pence for a worm's eye view of one end of a pitch. How much and what appreciation of the game did you get from there? Feck all I'll bet. At least Salisbury have built a plinth for their Kit Box seating sheds so that at least a half decent view can be had and you really should try watching the game from the Main Stand with all the obstructions and half of that was only built last year! The pitch had been vandalised to negate the skill differential, that was obvious and all in all if THAT is an example of the depths the Football League have sunk to in pandering to the non league lobby (Accrington is another appalling example) then we should all go home and have a rethink of just what IS acceptable in our national Full time Football League. In my opinion, Histon should not have been allowed to take part in the play offs and anyone who went to Kettering and saw their ground which prevented them from such participation on the grounds of not having a ten year lease in place can only sympathise wholeheartedly that they suffer at the hands of buffoons in blazers who make up these rulings. What IS the point of a ground if you can't see the bloody game in it? What IS the point of a pitch if you can't play football of a standard that warrants charging the prices demanded for entrance? Why should clubs with appalling facilities like that be allowed in a standard of football that is way above their capability of staging it in a satisfactory manner? If small clubs like FGR, Salisbury, and Eastbourne can provide comfortable facilities then so should Histon. Until they can they shouldn't be allowed that high in the football pyramid...............or if they are to be allowed a maximum charge of a fiver a head should be imposed on them until such time as they get their act together. Are they seriously comparing their seating arrangements and stadium comforts with the Kassam at Oxford or superior to ours? Because that is what they are implying in charging those rip off prices................and look where they stuck OUR seated fans ~ as far down in the corner for the worst view they could possibly have after traveling over five hundred miles for the privilege. That's like inviting someone to your home and only letting them stand just inside the front door. Be more gracious ~ What for watching your team get beaten up on a local rec and getting ripped off for the pleasure? I don't think so Chris! Buster - I thought Poke and Rice warmed up well - and like you saw them celebrating at the end. They certainly enjoyed this moment - just caught it on camera.. While we still were not able to get the ball down and play much football, Benyon did trouble them at times. do you think so Dave, do really, really think Benyon "troubled" them? Yes I really really really do merse as things livened up front for us once he came on, we know he will struggle against big strong center half's, can you tell me why Sills left him on his own in the middle to deal with them in the second half, while he kept playing out on the left touchline? I thought we had wingers to play out there. Benyon needs to feed of players like Sills, the ball winners who will look to play him in, I think he did well under the conditions he found himself playing under. You should not forget the important goals he has scored and ones that had he not, we would not have even been playing Histon yesterday. Danny Stevens had a great game in the home league, had the beating time and time again of the fullback and could have got himself a goal or two if he had got better shots away. On Histons bog of a pitch Danny struggled and yes he gave the ball away two many times and played some poor passes. Danny has played some good games for us and some not so good, its consistency he lacks, yes height and weight, but that did not seem to mater in the home leg as the guy he kept eating will ease was twice his size. On and on the bombardment goes from the Scarecrows and the only bit of the TV excitement I really enjoy is Robbi's fore arm smash into the face of one of the 'Crows which the inept and extremely benevolent ref deems unworthy of a red card................"oh OK then, seems like he ain't so bad after all!" I must pick you up on your statement above in the quote, I really can't believe that you think what Robertson did was OK and even entertaining? or have you just posted that to wind people up? 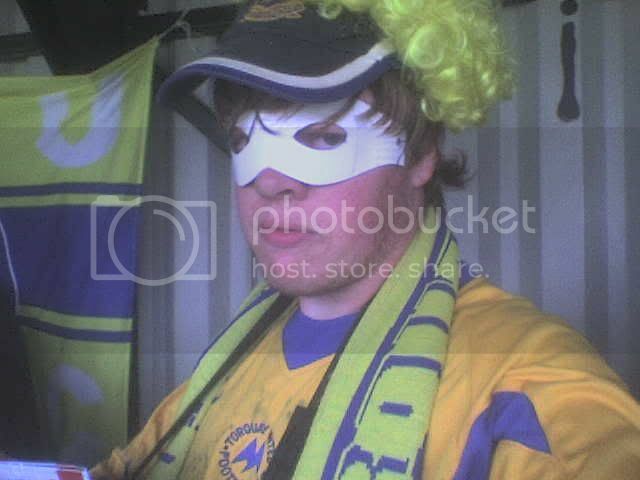 He deserved to walk for such dirty play and the game has no place in it for such violence, we should not forget how we have felt when a TUFC player has had his cheek bones smashed to pieces by a thuggish act from a player on the other side. If I was Bucks I would be having a strong word with Robertson, yes I know the histon players were ruffing up our players a bit, but that is no excuse for smashing someone in the face with your forearm. He knew what he was doing and meant to do it. Nothing to feel good or proud about merse, our player let himself and the good name of the team down, by trying to cause injury to another football player. What I asked you was did he really TROUBLE, Histon? I wasn't asking anything else and I personally don't think he troubled them one iota yesterday. Not to say he didn't give it his all not to say he didn't show the same courage as all the rest, just that as usual against big and strong defenders he couldn't compete and THAT is what is holding him back in his football career. As for taking Robbo to task or anyone else for that matter for fighting fire with fire......................leave it out Dave; how the hell did you think we got through that yesterday? You'll be wanting us to fire off a letter of thanks to Histon for their hospitality and wishing them all the best for next season next! Vandalising the pitch? Weren't we the ones guilty of that against Crawley recently? Clubs far more illustrious than Histon have been guilty of doctoring the pitch over the years in order to suit the tactics of the home team. Surely Stoke City are as guilty as Histon by making their pitch among the narrowest in the country in order to take advantage of Rory Delap's throw ins and limiting the space for attacking teams to play creative football. Stoke have the worst away record in the league and its noticable that Delap's throw-ins drop a lot shorter than they do at the Boothen End. I also remember a story Terry Venables wrote about Tommy Docherty when he (Tommy Doc) was Chelsea manager. He ordered the Groundsmen to leave the hoses on all night in order to waterlog a pitch so badly that they had to call the game off. Docherty, you see, was struggling to put out a side. The Kings Road was bone dry. I wasn't really picking up on your post as such but I was more disappointed to hear a few daft things some of our lot were singing and shouting at the end of the match yesterday. There's a time and place for singing "we'll never play you again" and shouting "I'm so effing glad I'm never coming back to this poxy effing ground". I put that down to a very tense second half and the relief that we'd managed to show enough resiliance to overcome what Histon could chuck at us in the second half. To me, its even more satisfying to beat them on aggregate this way but I'll say again that yesterday's referee was more of an obstacle than the pitch. We were playing a John Beck side, a man who used to let the grass grow longer in the corners in order to slow the ball up enough for the forwards to get there. As for the glassworld stadium. Well, its improved from our first visit and its pretty unrecognisable from the photo Barton Downs unearthed at the beginning of the season. Yes, its very basic but I've stood in worse away accomodation in recent years. Layer Road was awful, St James's Park is just as bad, Kenilworth Road is dire and Bristol Rover's ground ranks as probably the worst I've been to. I was soaked to the skin there once. At least Histon have got a roof of sorts! Its the first time I've stood up at a football and been able to reach up and touch the roof!! I haven't been to Forest Green Rovers (the new lawn or the old lawn), Salisbury's has zero facilities for those not willing to pay for the Prawn Sandwich Brigade Seats, but I'll agree that Eastbourne was quite a tidy little ground. Even Lewes had a certain charm. As for whether they deserved to be in the play offs? We'll they accumulated more points than us. They are in the Blue Square Premier on merit and have done amazingly well to get that far on the budget and support levels they have. Its highly debatable whether they could sustain a football league campaign but as Swindon, Leeds and even Swansea can testify they are worthy opponents whether you enjoy their tactics or not. Personally I think they've come as far as they can go and are probably punching above their weight. But as Manny Pacquiao proved that counts for nothing, even if you've got a dumb Mancunian with a non existant defence in front of you. Anyway I'm putting this latest Chris Wilder-esque posting from yourself down to a lack of sleep caused by the arrival of the new mini Merse. Heartfelt congratulations by the way. Merse three people spoke with me today about the match, they all felt we looked better in attack when Benyon came on, he did keep the Histon defenders busy when he had the chance and by doing so gave our defense a breather. Histon were physical for sure, but maybe I blinked as I did not see one real dangerous challenge from any of their players. The only two I saw was Robertsons with intend and the tackle by Stevens that could also been seen as a red card by some refs. Stevens clearly went in with his stubs showing and caught the player on his leg. I wonder what you would have said if the ref had seen Robertsons challenge the same as we saw it on the TV, if he had then Robertson would have been sent off. If then down to ten men and as a direct result of that they went and scored again, I bet you would have been shouting the loudest that he was a silly boy who should not have reacted the way he did, just because Histon were being a bit too physical. We can count our lucky stars the ref did not see, holding on with ten men might just have proved a bit to hard and we might then not be looking forward to a play-off final.